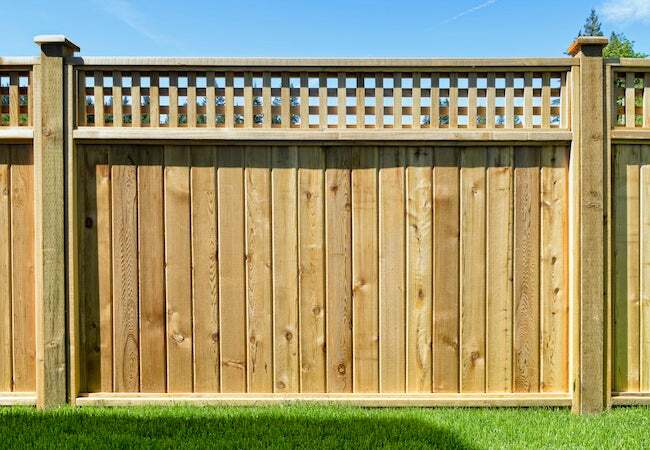 On the fence about what type of wood to choose for your fence? Learn some of the pros and cons for a handful of the most popular picks. There’s no shortage of wood fence options. Which is the right type for your property? In the end, it really comes down to the look you like, how much you’re willing to spend, and how much maintenance you’re comfortable with. Cedar boasts a beautiful red hue that weathers to a silvery grey. Plus, it repels insects and resists warping and shrinking. Eventually, though, cedar falls victim to rot, so expect to replace planks here and there over the years. Apply a penetrating sealant immediately after installation and repeat each and every year. Redwood and teak cost more—these are some of the most expensive fencing woods—but their softness and luster make them enduringly popular choices. For either wood to retain its beauty and remain viable as fencing, it needs to be re-sealed on an annual basis, just like cedar. Pressure-treated wood costs the least, and it stands up to insects and moisture, but warping sometimes sets in soon after installation. Take care in choosing planks at the lumberyard; look for the straightest and avoid any that appear greenish or feel the slightest bit damp.